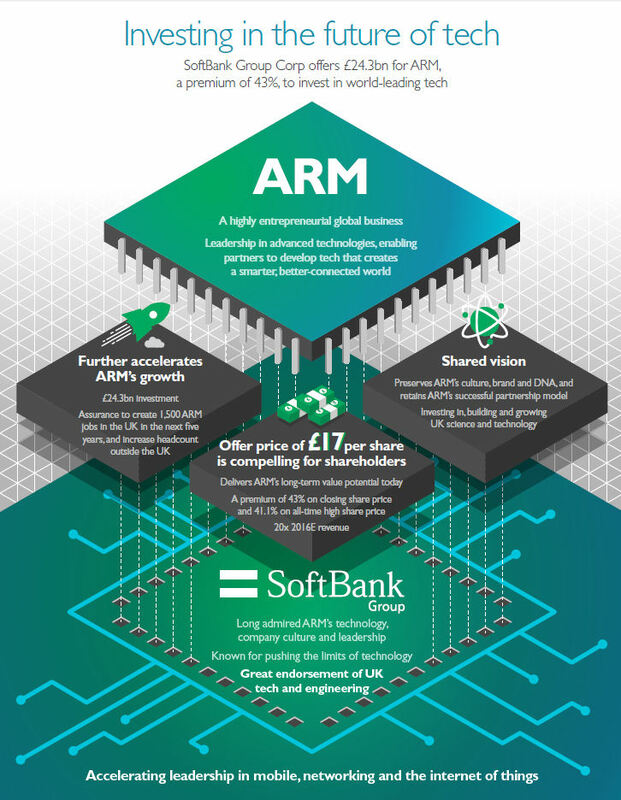 Japanese operator group Softbank has successfully bid £24.3 billion to buy UK mobile chip designer ARM in a bid to position itself at the centre of the IoT revolution. The bid represents a 43% premium to the ARM share price at close of trading on Friday last week and the ARM board has recommended shareholders accept it. In a press conference Masayoshi Son, Chairman, CEO and largest shareholder of SoftBank, said this move is a statement on belief in the growth potential of IoT and in UK industry in the aftermath of the vote to leave the European Union. He had recently decided to postpone his retirement as CEO and it now seems this is the reason. Softbank currently derives most of its revenue from its operator business in Japan, where it has around a quarter of all mobile subscribers, and US MNO Sprint, which has a 14% share of subscribers according to Ovum’s WCIS service. Son made no reference to strategic overlap with existing Softbank businesses and was keen to stress it has no conflict of interest with major ARM customers such as Apple, Samsung and Qualcomm, since it has no plans to manufacture or sell chips. “We have long admired ARM as a world renowned and highly respected technology company that is by some distance the market-leader in its field,” said Son. 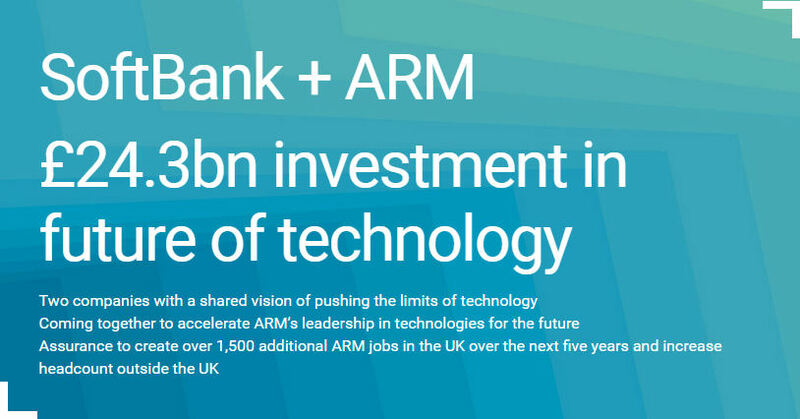 “ARM will be an excellent strategic fit within the SoftBank group as we invest to capture the very significant opportunities provided by the Internet of Things. “This investment also marks our strong commitment to the UK and the competitive advantage provided by the deep pool of science and technology talent in Cambridge. As an integral part of the transaction, we intend to at least double the number of employees employed by ARM in the UK over the next five years. At the press conference there was also lots of talk of long-termism. Son reiterated that this is a major strategic buy and fended off repeated questions about Brexit opportunism. He did concede that he only met with Chambers for the first time two weeks ago but said the timing was more a product of cashflow than anything else. In recent weeks Softbank has sold positions in Alibaba and Supercell to raise around $18 billion. Ultimately, said Son, this is a bet on the future of IoT. ARM is the world leader in the design of low-power processors and minimal power consumption will be even more important in embedded IoT modules than it is with phones. Furthermore, while ARM is good at things like applications processors and GPUs, it also has a long heritage in much smaller, simpler microcontrollers that use virtually no power. As a public company ARM is under constant short-term pressure to show quarterly growth, which can distract from the big picture. Becoming privately owned by a deep-pocketed parent will allow it to devote more resource to long-term R&D and, as Son said, make more aggressive investments of its own. He pointed out that the buying price is around 60x last year’s profits so he’s compelled to stay the course if he wants the investment to pay off. The party line is summarised in the infographic below. This looks like an exciting acquisition for IoT and the UK tech sector. IoT has almost limitless potential when you consider industry, automotive, smart cities, etc. Son also pointed out ARM’s advantages in datacentre chips and he clearly sees this as a bet on the future that is completely distinct from his other operations. He thinks IoT is the next major tech paradigm after the mobile internet and even went so far as to say this is the happiest moment in his life! With Softbank’s support ARM should be one of the principal players in the IoT revolution and it’s exciting to think of the innovations its new, longer-term strategy should yield.